Martin Lupinetti, Executive Director, HealthShare Exchange of Southeastern Pennsylvania, Inc.
For more than 25 years, Martin (Marty) Lupinetti has provided executive leadership, strategic planning, governance, policy and technology implementation, and deployment oversight to a variety of healthcare and public-sector entities in the region. Beginning in a consulting role in 2011, Marty led development of the business plan, governance, and financial sustainability model for start-up for of HealthShare Exchange –– an unprecedented cooperative effort by the Delaware Valley’s health systems and healthcare insurers. 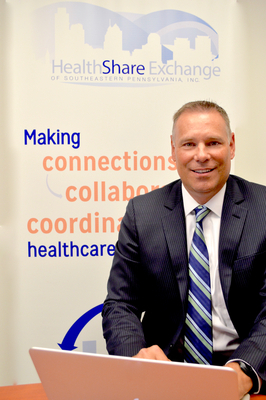 Now, as HSX’s executive director, Marty heads a staff connecting the points of care in the greater Philadelphia region, enabling the secure sharing of patient information to make medical services more informed and more efficient. Health information exchange can reduce readmissions and redundant services, lead to prompter more-targeted care, and improve the health of populations. Marty envisions HSX becoming a platform for further collaboration of different innovations resulting from a central source and repository of our region’s health data. Prior to this role, Marty was a Principal and Public Sector Lead, with the North Highland Company. Additional work history includes leadership roles with Deloitte Consulting, PwC, and CSC, where he focused on large IT management, shared services, project management and software development engagements including State of New Jersey policy office supporting a wide variety of statewide health IT initiatives. Publications and speaking engagements include local and national organizations on the topics of health IT, healthcare transformation and improving patient care with “intelligent push” technologies. Marty serves as president elect of the board of the Delaware Valley Healthcare Information Management Systems Society (DVHIMSS) an organization that is leading the health IT conversation in the DE Valley, representing 2000 members. Lupinetti, Martin, "A Regional Community Asset to Facilitate Collaboration and Innovation" (2016). College of Population Health Forum. Presentation 104.